The internet was riveted by a video of a wolf chasing a dog through the woods that was taken by the dog's owner. 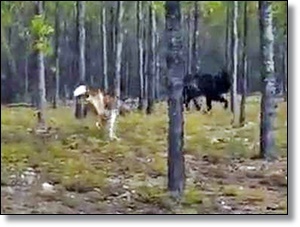 The footage was shot in northern Saskatchewan, Canada. First, the dog is barking at something in the background. A huge wolf then leaps toward the dog who begins barking more frantically. The owner can be heard in the video shouting at the two. The owner is a fishing guide at the place where the video was shot, and he said they are used to having black bears come around from time to time. 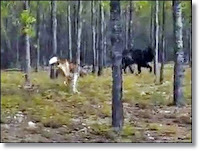 This giant black wolf that turned up for several days was a surprise. The man said he was inside with the lodge manager when they saw the wolf. He grabbed his camera while the manager grabbed a gun. The wolf actually caught up with the dog and threw her in the air, and the lodge manager had to fire into the air to make it stop. The dog had some minor injuries but recovered. The wolf returned two more times that day looking for the dog. Some of the many viewers of the video estimated the wolf must have been about seven feet long.